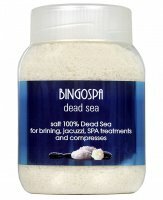 Foot salt by BINGOSPA. It contains beneficial mint extracts, peppermint oil, magnesium sulphate, potassium aluminum sulphate, and zinc oxide and citric acid. Due to the fact that on the feet there are many sweat glands and few sebaceous glands, they are exposed to significant overdrying and a problem with sweating. 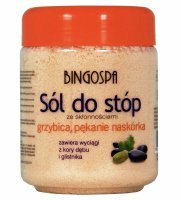 The solution to these unpleasant ailments is specially formulated foot salt that does not cause allergies or irritates. It will help to inhibit sweating and heel cracking in a quick way. 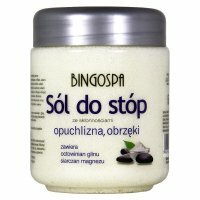 In addition, during regular use, the feet become refreshed, relaxed and their edema abolished. It provides a feeling of freshness and relaxation. 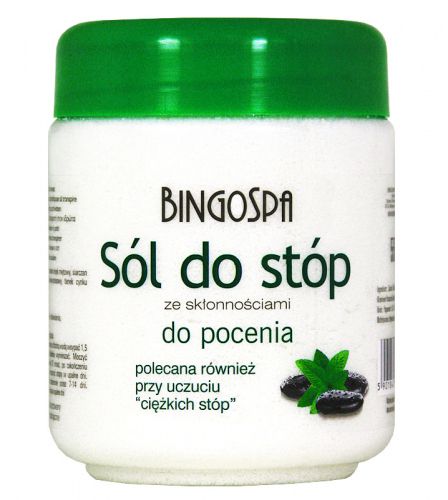 It helps in getting rid of the problem of sweating and cracked heels. Approx 150g of salt (1.5 capsules) dissolve in 3-4 liters of cold water. Feel soak for at least 15 minutes. Repeat daily from 7-14 days.